The North Pole, also known as the Geographic North Pole or Terrestrial North Pole, is, subject to the caveats explained below, defined as the point in the northern hemisphere where the Earth's axis of rotation meets the Earth's surface. It should not be confused with the North Magnetic Pole. The North Pole is the northernmost point on Earth, lying diametrically opposite the South Pole . It defines geodetic latitude 90° North, as well as the direction of True North. At the North Pole all directions point south; all lines of longitude converge there, so its longitude can be defined as any degree value. While the South Pole lies on a continental land mass , the North Pole is located in the middle of the Arctic Ocean amidst waters that are almost permanently covered with constantly shifting sea ice. This makes it impractical to construct a permanent station at the North Pole (unlike the South Pole ). However, the Soviet Union , and later Russia , have constructed a number of manned drifting stations, some of which have passed over or very close to the Pole. In recent years, a number of studies have predicted that the North Pole may become seasonally ice-free due to Arctic shrinkage, with timescales varying from a few years to fifty years or more. The sea depth at the North Pole has been measured at 4,261 metres (13,980 ft). The nearest land is usually said to be Kaffeklubben Island , off the northern coast of Greenland about 700 km (440 mi) away, though some perhaps non-permanent gravel banks lie slightly further north. The Earth's axis of rotation – and hence the position of the North Pole – was commonly believed to be fixed (relative to the surface of the Earth) until, in the 18th century, the mathematician Leonhard Euler predicted that the axis might "wobble" slightly. Around the beginning of the 20th century astronomers noticed a small apparent "variation of latitude," as determined for a fixed point on Earth from the observation of stars. Part of this variation could be attributed to a wandering of the Pole across the Earth's surface, by a range of a few meters. The wandering has several periodic components and an irregular component. The component with a period of about 435 days is identified with the 8 month wandering predicted by Euler and is now called the Chandler wobble after its discoverer. The exact point of intersection of the Earth's axis and the Earth's surface, at any given moment, is called the "instantaneous pole," but because of the "wobble" this cannot be used as a definition of a fixed North Pole (or South Pole) when metre-scale precision is required. It is desirable to tie the system of Earth coordinates (latitude, longitude, and elevations or orography) to fixed landforms. Of course, given plate tectonics and isostasy, there is no system in which all geographic features are fixed. Yet the International Earth Rotation and Reference Systems Service and the International Astronomical Union have defined a framework called the International Terrestrial Reference System. The North Pole of this system now defines geographic North for precision work, and it does not quite coincide with the rotation axis. As early as the sixteenth century, many eminent people believed (correctly) that the North Pole was in a sea, which in the nineteenth century was called the Polynia or Open Polar Sea. It was therefore hoped that passage could be found through ice floes at favorable times of the year. Several expeditions set out to find the way, generally with whaling ships, already commonly used in the cold northern latitudes. One of the earliest expeditions to set out with the explicit intention of reaching the North Pole was that of British naval officer William Edward Parry, who in 1827 reached latitude 82°45′ North. In 1871 the Polaris expedition, an American attempt on the Pole led by Charles Francis Hall, ended in disaster. An 1879–1881 expedition commanded by US naval officer George Washington DeLong also ended tragically when their ship, the USS Jeanette, was crushed by ice. Over half the crew, including DeLong, were lost. In April 1895 the Norwegian explorers Fridtjof Nansen and Fredrik Hjalmar Johansen struck out for the Pole on skis after leaving Nansen's icebound ship Fram . The pair reached latitude 86°14′ North before they were forced to turn back. In 1897 Swedish engineer Salomon August Andrée and two companions tried to reach the North Pole in the hydrogen balloon Örnen ("Eagle"), but were stranded 300 km north of Kvitøya , the northeasternmost part of the Svalbard Archipelago, and perished on this lonely island. In 1930 the remains of this expedition were found by the Norwegian Bratvaag Expedition. The Italian explorer Luigi Amedeo, Duke of the Abruzzi and Captain Umberto Cagni of the Italian Royal Navy (Regia Marina) sailed the converted whaler Stella Polare from Norway in 1899. On March 11, 1900 Cagni led a party over the ice and reached latitude 86° 34’ on April 25, setting a new record by beating Nansen's result of 1895 by 35 to 40 kilometres. Cagni barely managed to return back to the camp, remaining there until June 23. On August 16 the Stella Polare left Rudolf Island heading south and the expedition returned to Norway. The American explorer Frederick Albert Cook claimed to have reached the North Pole on April 21, 1908 with two Inuit men, Ahwelah and Etukishook, but he was unable to produce convincing proof and his claim is not widely accepted. The conquest of the North Pole was for many years credited to American Navy engineer Robert Peary, who claimed to have reached the Pole on April 6, 1909, accompanied by American Matthew Henson and four Inuit men named Ootah, Seeglo, Egingwah, and Ooqueah. However, Peary's claim remains controversial. The party that accompanied Peary on the final stage of the journey included no one who was trained in navigation and could independently confirm his own navigational work, which some claim to have been particularly sloppy as he approached the Pole. The distances and speeds that Peary claimed to have achieved once the last support party turned back seem incredible to many people, almost three times that which he had accomplished up to that point. Peary's account of a journey to the Pole and back while traveling along the direct line – the only strategy that is consistent with the time constraints that he was facing – is contradicted by Henson's account of tortuous detours to avoid pressure ridge and open leads. The British explorer Wally Herbert, initially a supporter of Peary, researched Peary's records in 1989 and concluded that they must have been falsified and that Peary had not reached the Pole. Support for Peary came again in 2005, however, when the British explorer Tom Avery and four companions recreated the outward portion of Peary's journey with replica wooden sleds and Canadian Eskimo Dog teams, reaching the North Pole in 36 days, 22 hours – nearly five hours faster than Peary. Avery writes on his web site that "The admiration and respect which I hold for Robert Peary, Matthew Henson and the four Inuit men who ventured North in 1909, has grown enormously since we set out from Cape Columbia. Having now seen for myself how he travelled across the pack ice, I am more convinced than ever that Peary did indeed discover the North Pole." The first claimed flight over the Pole was made on May 9, 1926 by US naval officer Richard E. Byrd and pilot Floyd Bennett in a Fokker tri-motor aircraft. Although verified at the time by the US Navy and a committee of the National Geographic Society , this claim has since been disputed. The first undisputed sighting of the Pole was on May 12, 1926 by Norwegian explorer Roald Amundsen and his American sponsor Lincoln Ellsworth from the airship Norge. Norge, though Norwegian owned, was designed and piloted by the Italian Umberto Nobile. The flight started from Svalbard and crossed the icecap to Alaska . Nobile, along with several scientists and crew from the Norge, overflew the Pole a second time on May 24, 1928 in the airship Italia. The Italia crashed on its return from the Pole, with the loss of half the crew. In May 1945 an RAF Lancaster of the Aries expedition became the first Commonwealth aircraft to overfly the North Geographic and North Magnetic Poles. The plane was piloted by David Cecil McKinley of the Royal Air Force. It carried an 11-man crew, with Kenneth C. Maclure of the Royal Canadian Air Force in charge of all scientific observations. In 2006, Maclure was honoured with a spot in the Canadian Aviation Hall Of Fame. Discounting Peary's disputed claim, the first men to set foot at the North Pole were, according to some sources, a Soviet Union party. These are variously described as including Pavel Gordiyenko (or Geordiyenko) and three or five others, or Aleksandr Kuznetsov and 23 others, who landed a plane (or planes) there on April 23, 1948. According to Antarctica.org, three Li-2 planes landed, carrying a total of seven men. On May 3, 1952, U.S. Air Force Lieutenant Colonel Joseph O. Fletcher and Lieutenant William P. Benedict, along with scientist Albert P. Crary, landed a modified C-47 Skytrain at the North Pole. Some sources consider this (rather than the Soviet mission) to be the first ever landing at the Pole. 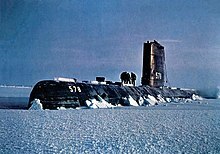 The United States Navy submarine USS Nautilus (SSN-571) crossed the North Pole on August 3, 1958, and on March 17, 1959, the USS Skate (SSN-578) surfaced at the Pole, becoming the first naval vessel to do so. Setting aside Peary's claim, the first confirmed surface conquest of the North Pole was that of Ralph Plaisted, Walt Pederson, Gerry Pitzl and Jean Luc Bombardier, who traveled over the ice by snowmobile and arrived on April 19, 1968. The United States Air Force independently confirmed their position. On April 6, 1969, Wally Herbert and companions Allan Gill, Roy Koerner and Kenneth Hedges of the British Trans-Arctic Expedition became the first men to reach the North Pole on foot (albeit with the aid of dog teams and air drops). They continued on to complete the first surface crossing of the Arctic Ocean – and by its longest axis, Barrow, Alaska to Svalbard – a feat that has never been repeated. Because of suggestions of Plaisted's use of air transport, some sources classify Herbert's expedition as the first confirmed to reach the North Pole over the ice surface by any means. On August 17, 1977, the Soviet nuclear powered icebreaker Arktika completed the first surface vessel journey to the North Pole. In 1982 Sir Ranulph Fiennes and Charles Burton became the first people to cross the Arctic Ocean in a single season. They departed from Cape Crozier, Ellesmere Island , on 17 February 1982 and arrived at the geographic North Pole on 10 April 1982. They travelled on foot and skidoo. From the Pole, they travelled south towards Svalbard but, due to the unstable nature of the ice, ended their crossing at the ice edge after drifting south on an ice floe for 99 days. They were eventually able to walk to their expedition ship "MV Benjamin Bowring" and boarded it on 4 August 1982 at position 80:31N 00:59W. As a result of this journey, which formed a section of the three-year Transglobe Expedition 1979–1982, Fiennes and Burton became the first people to complete a circumnavigation of the world via both North and South Poles, by surface travel alone. This achievement remains unchallenged to this day. In recent years, journeys to the North Pole by air (landing by helicopter or on a runway prepared on the ice) or by icebreaker have become relatively routine, and are even available to small groups of tourists through adventure holiday companies. In 2005, the United States Navy submarine USS Charlotte (SSN-766) surfaced through 155 cm (61 inches) of ice at the North Pole and spent 18 hours there. In April 2007, Dutch performance artist Guido van der Werve performed a work of art at the North Pole. By standing exactly on the Pole for 24 hours and turning slowly clockwise (the earth is turning counterclockwise), just by following his own shadow, Van der Werve literally did not turn with the world for one day. This performance is called: 'nummer negen [Dutch for Number Nine], the day I didn't turn with the world'. Van der Werve time-lapsed the 24 hours to 9 minutes. In July 2007, British endurance swimmer Lewis Gordon Pugh completed a 1 km swim at the North Pole. His feat, undertaken to highlight the effects of climate change, took place in clear water that had opened up between the ice floes. His later attempt to paddle a kayak to the North Pole in late 2008, following the erroneous prediction of clear water to the Pole, was stymied when his expedition found itself stuck in thick ice after only three days. The expedition was then abandoned. A 2007 episode of the BBC motoring show Top Gear, in which the presenters were described as journeying to the "North Pole," was in fact an expedition to the 1996 position of the North Magnetic Pole. On August 2, 2007, a Russian VASU made the first ever manned descent to the ocean bottom at the North Pole, to a depth of 4.3 km, as part of a research programme in support of Russia's 2001 territorial claim to a large swathe of the Arctic Ocean . The descent took place in two MIR submersible and was led by Soviet and Russian polar explorer Arthur Chilingarov. In a symbolic act, the Russian flag was placed on the seabed at the exact position of the Pole. The expedition is the latest in a decades-long series of moves by Russia intended to show that it is the dominant influence in the Arctic. The warming Arctic climate and summer retreat of sea ice there has suddenly turned the attention of countries from China to the United States toward the top of the world, where resources and shipping routes may soon be exploitable. At the North Pole, the sun is permanently above the horizon during the summer months and permanently below the horizon during the winter months. Sunrise is just before the vernal equinox (around March 19); the sun then takes three months to reach its highest point of about 23½° elevation at the summer solstice (around June 21), after which time it begins to sink, reaching sunset just after the autumnal equinox (around September 24). When the sun is visible in the polar sky, it appears to move in a clockwise circle above the horizon. This circle gradually rises from near the horizon just after the vernal equinox to its maximum elevation (in degrees) above the horizon at summer solstice and then sinks back toward the horizon before sinking below it at the autumnal equinox. These effects are caused by a combination of the Earth's axial tilt and its revolution around the sun. The direction of the Earth's axial tilt, as well as its angle relative to the plane of the Earth's orbit around the sun, remains very nearly constant over the course of a year (both change very slowly over long time periods). At northern midsummer the North Pole is facing towards the sun to its maximum extent. As the year progresses and the Earth moves around the sun, the North Pole gradually turns away from the sun until at midwinter it is facing away from the Sun to its maximum extent. A similar sequence is observed at the South Pole , with a six-month time difference. In most places on Earth, local time is roughly synchronized to the position of the sun in the sky. Thus, at midday the sun is roughly at its highest. This method fails at the North Pole where the sun is continuously in the sky for six months. There is no permanent human presence at the North Pole, and no particular time zone has been assigned. Polar expeditions may use any time zone that is convenient, such as GMT, or the time zone of the country they departed from. Winter (January) temperatures at the North Pole can range from about −43 °C (−45 °F) to −26 °C (−15 °F), perhaps averaging around −34 °C (−30 °F). Summer temperatures (June, July and August) average around the freezing point (0 °C, 32 °F). The sea ice at the North Pole is typically around two or three meters thick, though there is considerable variation and occasionally the movement of floes exposes clear water. Studies have shown that the average ice thickness has decreased in recent years. Many attribute this decrease to global warming, though this conclusion is disputed by some. Reports have also predicted that within a few decades the Arctic Ocean will be entirely free of ice in the summer months. This may have significant commercial implications; see "Territorial Claims," below. Polar bears are believed rarely to travel beyond about 82° North owing to the scarcity of food, though tracks have been seen in the vicinity of the North Pole, and a 2006 expedition reported sighting a polar bear just one mile (1.6 km) from the Pole. The ringed seal has also been seen at the Pole, and Arctic foxes have been observed less than 60 km away at 89°40′ N.
Under international law, no country currently owns the North Pole or the region of the Arctic Ocean surrounding it. The five surrounding Arctic countries, Russia , Canada , Norway , Denmark (via Greenland ), and the United States (via Alaska ), are limited to a Exclusive Economic Zone around their coasts, and the area beyond that is administered by the International Seabed Authority . Upon ratification of the United Nations Convention on the Law of the Sea, a country has a ten year period to make claims to extend its 200 mile zone. Norway (ratified the convention in 1996), Russia (ratified in 1997), Canada (ratified in 2003) and Denmark (ratified in 2004) have all launched projects to base claims that certain Arctic sectors should belong to their territories. In some Western cultures, the geographic North Pole is the residence of Santa Claus. Canada Post has assigned postal code H0H 0H0 to the North Pole (referring to Santa's traditional exclamation of "Ho-ho-ho!"). This seemingly mundane fact actually reflects an age-old esoteric mythology of Hyperborea that posits the North Pole, the otherworldly world-axis, as the abode of God and superhuman beings (see Joscelyn Godwin, Arktos: The Polar Myth). The popular figure of the pole-dwelling Santa Claus thus functions as an esoteric archetype of spiritual purity and transcendence (). As Henry Corbin has documented, the North Pole plays a key part in the cultural worldview of esoteric Sufism and Iranian mysticism. "The Orient sought by the mystic, the Orient that cannot be located on our maps, is in the direction of the north, beyond the north." The Pole is also identified with a mysterious mountain in the Arctic Ocean, called Mount Qaf (cf. Rupes Nigra), whose ascent, like Dante's climbing of the Mountain of Purgatory, represents the pilgrim's progress through spiritual states. In Iranian theosophy, the heavenly Pole, the focal point of the spiritual ascent, acts as a magnet to draw beings to its "palaces ablaze with immaterial matter." Fantasy flights often refer to a flight to the North Pole for these same reasons. Goudarzi, Sara, "Meltdown: Ice Cracks at North Pole." Sept 2006, LiveScience, <<A href="http://www.livescience.com/environment/060920_arcticice_opening.html" target="_blank"> Web Link>, Accessed 29 January 2007.